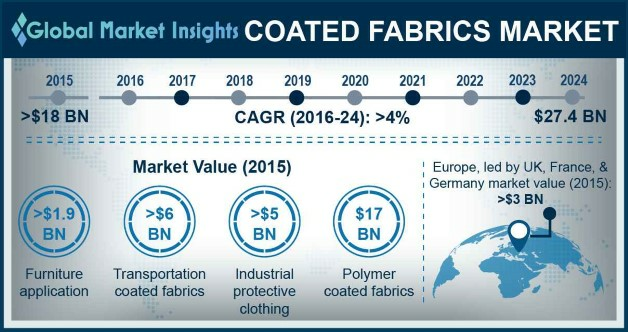 Coated Fabrics Market size surpassed USD 18 billion in 2015, with estimated gains at over 4% CAGR from 2016 to 2024. Strong application outlook in manufacturing air bags and seat covers in automotive industry coupled with stringent regulatory compliances to give protective clothing to labors are key trending factors driving global coated fabrics market size. Global automobile sales were over 86 million units in 2015, passenger cars contributed about 63 million units and commercial sale were 20 million units in the same year. Automobile production is projected to surpass 100 million units by 2018. Increasing automotive sales in China, Thailand, India, and Indonesia should stimulate product demand. Consistent aesthetic improvements & scope for seat cover design customization will promote product use as a low cost alternative to leather. Global industrial protective clothing spending was over USD 5 billion in 2015, increasing at over 14% CAGR. Agriculture, chemical processing, food processing, law enforcement, medical, and military are major industries using protective clothing where participants must be shielded from chemicals, heat, biological contaminants, or other environmental risks. Government implementations such as Model Work Health and Safety Act in Australia and European Union’s Directive 89/686/EEC are influencing industries towards industrial protective clothing adoption. Nylon is the most widely used coated fabric substrate over its counterpart such as polyester due to its light weight and amenability to a variety of coatings. Industry profitability is mainly dependent on the production of end use products such as and competition level from alternative materials including plastic, leather, and uncoated fabrics, and rubber sheeting. Transportation industry majorly influenced coated fabrics demand due to product applicability in motor vehicles, aerospace, and marines. Presence of many substitute materials including leather & plastics accompanied by toxic residue while manufacturing may threat industry growth. Comparatively less cost of plastic and having large applicability could impact coated fabrics market price trend. Polymer coated fabrics market size generated USD 17 billion business in 2015 and continue to increase due to surging demand for airbags in automobile and protective clothing in manufacturing companies. China, South Korea, and Germany being the major contributor in automotive and aerospace industry should ease product demand. Rubber fabrics may surpass USD 2 billion revenue by 2024 due to its durability, elasticity, flexibility, and resistant to degradations properties. The product’s major applications include automotive upholstery, storage bags, food conveyor belts, rainwear, boats, lifeboats, gymnasium mats, aprons, truck covers, and protective garments. Growing demand from the industrial & commercial base and revitalizing construction industry especially in Indonesia, China, Malaysia and India will continue to drive the growth of this segment. Also, increase in public infrastructure spending and rise in consumer interest in home interiors will drive fabric wall backed covering demand. Transportation lead the industry application segment and was worth over USD 6 billion in 2015, mainly due to execution of safety standards for automobiles and industrial workers coupling with government initiatives such as National Highway Traffic Safety Administration (NHTSA) to promote safe driving has encouraged coated fabrics market growth. Additionally, increasing application scope in producing insulators on space shuttle for solid rocket nozzles will fuel coated fabrics market growth. Protective clothing applications are projected to expand at 4% CAGR up to 2024. Standardized safety protective measures implementation to the workers associated with industrial operations and safety packages use in rescue and swimming purposes will drive protective clothing market. Aprons, chemical and hazardous material suits, clean room clothing, cut and slash-resistant clothing, gloves, footwear, reflective clothing, and space suits are widely used protective clothing. Europe, led by UK, France, & Germany coated fabrics market share generated over USD 3 billion revenue in 2015. Regulatory norms associated to worker’s safety and standardized guidelines to passenger safety are key factors stimulating regional industry growth. Rising penetration in transportation and protective clothing applications due to presence of numerous manufacturing companies should drive China coated fabrics market size. APAC may see over 4% growth owing to emerging business in chemical, automotive, and healthcare industry in South Korea, India, and Malaysia. With stringent guidance from National Fire Protection Association (NFPA), OSHA, and ASTM, U.S. is a highly legalized industry. Incursions into shale exploration and renewable chemicals commercialization has observed an improvement in the regional protective clothing market. Presence of large scale construction projects in Saudi Arabia, Kuwait, and UAE accompanied by regulations of labor security should favor Middle East & Africa coated fabrics industry growth. Global coated fabrics market share is highly fragmented as the industry top six players accounting for over 25% of the global demand. On the basis of revenue, major industry player includes Omnova Solutions, Takata Corporation, Saint-Gobain, Canadian General Tower, and Trelleborg. Coated fabric comprises of plastic, rubber, lacquer, polyethylene, varnish making them more flexible and durable. The product can be classified into three primary types based on the raw material used; Polymer, which are produces from various polyvinyl chloride’s emulsions and mixtures. The main feature these material is that they are manufactured at a relatively low cost and can be used in a wide range of applications, including awnings, seating, industrial curtains, upholstery. Rubber-coated fabrics are manufactured using latex as their base and are used in applications catering to the aviation and marine industry. As these products have a variety of performance characteristics such as resistance to oils, chemicals, and damage from ultra violet rays, they are durable. With all these characteristics, the product find use in protective clothing, inflammable boats, oil blooms, and bellows that are subjected to harsh environment conditions. Fabric-backed wall coverings consist of a solid vinyl coating applied to a woven fabric. The performance characteristics of these vary based on the type of coating applied. Unlike the broader textile industry, this industry is specialized in nature and their characteristics find use in many industrial applications. These products are used in applications such as automobile, aviation, marine, furniture, and construction. The demand for the product is directly proportional to its application; hence with increase in demand for transportation, industrial products, and furniture, it is expected that the market would increase.